Days after launching as an early release beta, Starbound has rolled out the first of many updates to add new content and tweak the old. The main focus of this patch was to re-balance weapon damage and the leveling system, but several new items and enemies made the cut, including a staple for sandbox games: grappling hooks! Taking plenty of cues from creative exploration/building games like Terraria, Starbound hands you a spaceship and lets you explore a seemingly infinite number of worlds, all while fighting monsters, gathering ores, crafting equipment and uncovering secrets. Online play supports up to eight players adventuring through the galaxy together, making tasks like tackling dungeons or raiding prisons a little bit easier. Also, there's a great and powerful ape god. With propaganda posters. 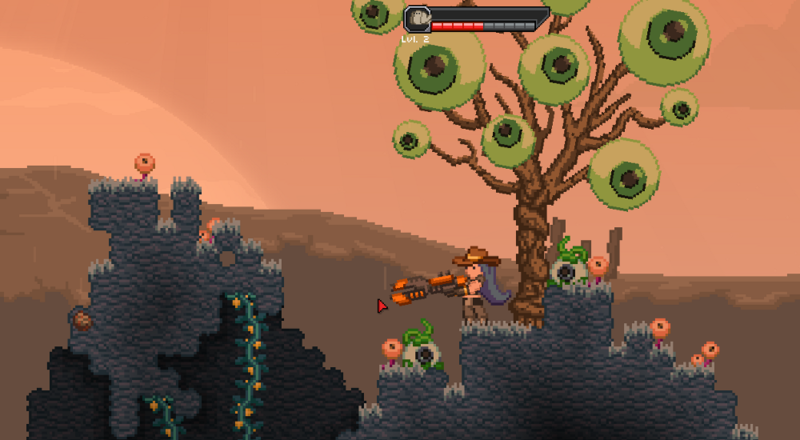 Starbound is currently available in its beta form. If you dive in and pre-order now, be warned that some updates actually wipe your old games, forcing you to start over from scratch. Beta woes and all that, right? The team is working on fixes that will hopefully make character deletion a thing of the past. In the meantime, it's actually sort of fun to pillage and plunder knowing your life has an expiration date. Really, it is. See below for a more complete list of fixes and additions in the recent update. eaponry, not currently used but will allow us to add secondary attacks to weaponry very soon.